Rodolfo Edgardo Soria was born in Paradise, Dolphin Gallo, Cruz Alta, province of Tucumán, Argentina. He studied at the School of Fine Arts and UNT. the Bachelor of Arts. In 1985 he settled in Santiago del Estero, where he teaches at the Institute of Fine Arts. Juan Yaparí and secondary and primary schools. He participated in several national and international symposia and biennials. 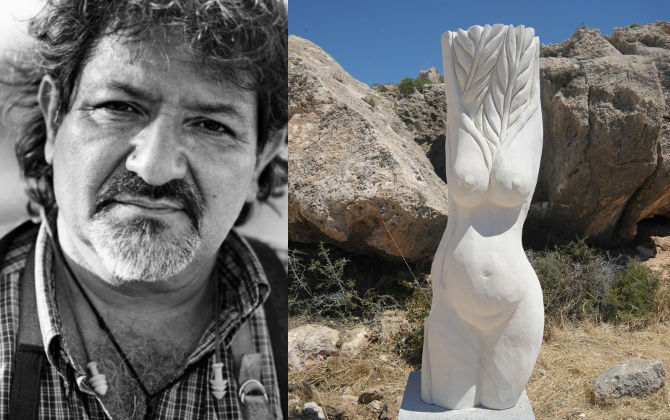 His works are in private collections in Córdoba, Tucumán, Salta, Jujuy, Entre Ríos, Santiago del Estero, Buenos Aires and Tierra del Fuego, Chaco, Córdoba, Entre Rios, Formosa Mexico, Germany, Italy, Bolivia, Colombia, Peru and Brazil. Title of the project: "Goddess Demeter"
Concept: "For the Greek goddess Demeter deity is fertile earth goddess of wheat, as is the Pacha Mama, mother earth for culture Andia. The work is a figurative representation where the female torso symbolizing earth as it is she who provides food. Symbolically the ears of wheat emerge from your body".